The Tiny Blue Butterfly: Hey, Chick! Such a fun card, totally makes me smile! I love the funny chick and how she is jumping in to the frame... Hilarious design! Great colors too and the inlaid die technique is brilliant for CAS. Thanks so much for having me as GD at LIM! Oh my gosh, this little guy is just too cute...makes me smile! That chick made me laugh...looks like me in the morning!! Great card. 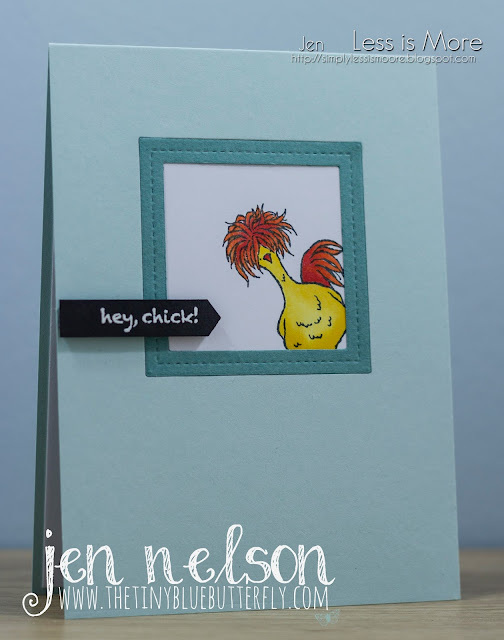 I love this quirky chick and the fab angle that she is peeking out of the frame at! Great design, Jen! Almost a peek-a-boo Jen ! So funny ! I love your CAS design and this clever idea of the inlaid frame ! This chick is so funny and makes me think about the crazy chicken (Chicken Joe) in the animation movie Surf's Up ! Fabulous card Jen ! Thanks for sharing and for inspiring. This quirky chap can't fail to raise a smile - your frame sets him off beautifully Jen.